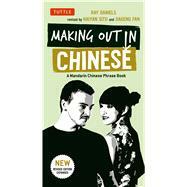 Making Out in Chinese is your indispensable guide to contemporary Chinese as it's really spoken on the streets of Beijing, Shanghai, Taipei or Singapore. Each expression in this phrase book is given in Chinese characters and their pinyin (Romanized) equivalent. It is designed to enhance your experience in using the language (and in a pinch, you can show the Chinese text to the person you're speaking to). Making Out in Chinese also includes interesting tips on social norms and cultural practices, eating, social media, hanging out, and other situations. The last chapter on Vogue Expressions lists many contemporary slang expressions that are popular these days. For the savvy traveler, this is a Chinese phrase book you won't want to be without! Original edition by Ray Daniels who studied Chinese as an exchange student in Taiwan and Beijing. He met his Chinese wife in a tea shop in Taiwan. Revised by Haiyan Situ, a Beijing native who has taught Chinese at the University of Otago, New Zealand. Revised by Jiageng Fan who specializes in the linguistic relationship between the Chinese and Japanese languages and scripts, focusing on the etymology of characters. He has lived, studied and taught Chinese, Japanese and/or English in China and Australia and has traveled extensively. After obtaining a B.A. at Guangdong University of Foreign Studies, then working as a magazine editor, he moved to Christchurch, New Zealand, where he earned a First Class Honours Degree from the University of Canterbury. He is pursuing his PhD at the University of Canterbury.